Create the form on the a Landing Page that you wish to post to. An example HTTP post with placeholders for posting to the Landing Page will be generated. The HTTP post includes a unique key which must be included for the form to be submitted. If the key is not included the page will be presented with only prepopulated form fields and will still require that the user clicks the SUBMIT button to complete the form submit. Replace the example HTTP Post information with the details that you wish to post. During the HTTP Post, based on any field matching logic on the form summited, MOBIT will try and dedupe the contact on the fly by checking if any existing contact exists in your MOBIT account. Based on the result you will be passed back the following response. You can include an optional system parameter during the HTTP Post. This allows the Opt In Status of the contact to be set during the process. The optional parameter is called “OptInStatus” and can be appended to the API call as follows. NOTE: If the Double Opt In Bypass State for the target HTTP Post set to “ON”, then this will override any values being passed in during the post. Please refer to MOBIT’s knowledge base for further details. 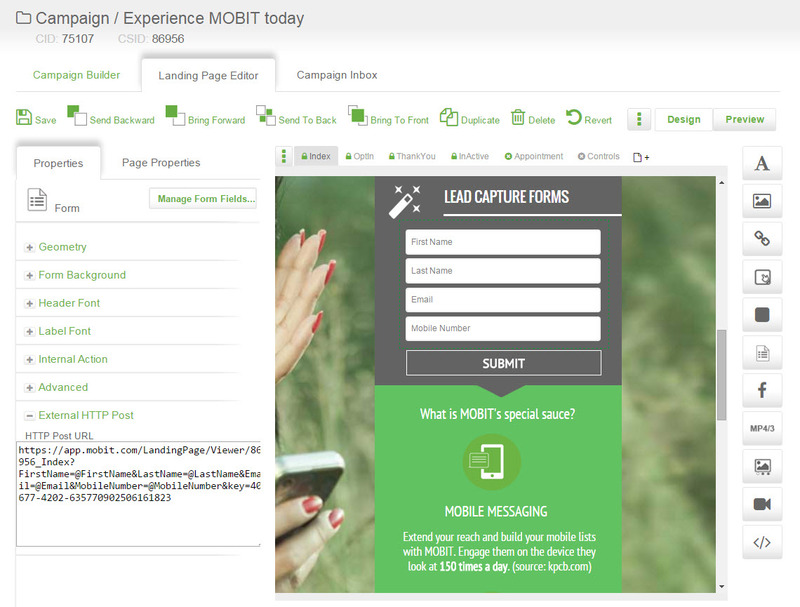 MOBIT includes the ability to post to Landing Pages using JSON and XML.